Score, force a turnover, repeat. That seemed to be the game plan in what was perhaps the most exciting, yet simultaneously shocking, half of football I’ve ever seen in my young life. The Ducks steamrolled Florida State, utilizing a second half where Oregon scored 34 unanswered points and FSU turned the ball over on five of six straight drives. It was almost unbelievable, considering no matter how confident I’d been in the Ducks’ ability, there was no way I, nor anyone, could have predicted the outcome of yesterday’s game. It started out slow, with the Ducks seeing star Devon Allen go down on the opening kickoff. Marcus Mariota missed a few throws, and the defense was having trouble stopping the run. At halftime, coach Mark Helfrich emphasized the need to clean it up. I’d say outscoring an undefeated Power Five team 41-7 in the second half is cleaning it up. The immediate loss of Devon Allen seemed to shake the Ducks early. When all was said and done, the Ducks walked off the field outscoring their opponents 110-33 in their past two games. You think OSU is excited to play us after their Sugar Bowl upset? Think again. 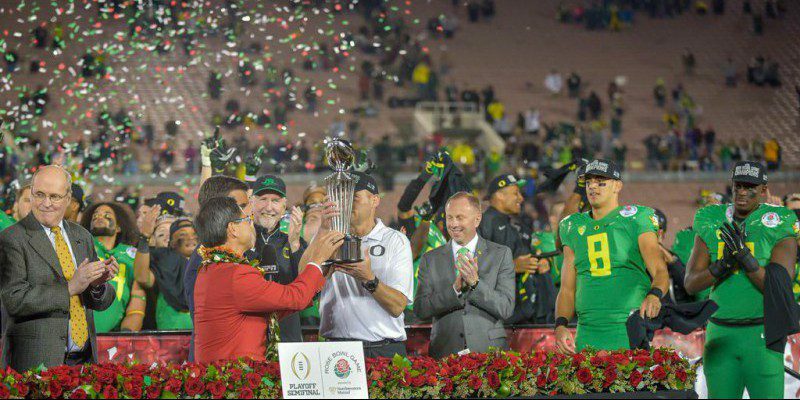 In the spirit of the Rose Bowl and the Ducks’ dominant victory, here are eight notes from the game to commemorate Oregon’s eight touchdowns against the Noles. 1. A team absolutely can’t turn the ball over against us (Royce Freeman one-yard run). It’s no secret our defense isn’t excellent. Outside of the Arizona game, they give up a lot of yards per game and often a lot of points, too. I mean, FSU had 528 total yards in the Rose Bowl. What the Ducks’ defense is, though, is opportunistic. With an offense that can put up 59 points, a defense doesn’t have to be perfect. Ours isn’t, but when given the chance to produce a turnover, that is something they excel at. Spearheaded by Erick Dargan, the Ducks created five turnovers in the second half, and in turn buried FSU in a hole so deep that even Jameis Winston couldn’t dig himself out of it. Before the game I felt two turnovers would be enough for us to win. With five, we were able to almost triple FSU’s score. FSU was so bad in that second half that even the referee fell down when Winston turned the ball over. 2. Erick Dargan (Thomas Tyner one-yard run). The senior safety gets a note all to himself after last night’s performance. With FSU threatening to score again and bring the game to 32-27, Dargan forced a second Dalvin Cook fumble after an impressive catch and run. On the following FSU drive, he picked off a tipped Winston pass and in turn single handedly buried any hope the Seminole sideline had left. The pick could have been Dargan’s second of the game, but the senior just barely missed a first half pick in the end zone when he jumped a short-post route. Both he and Troy Hill brought intensity and passion to a secondary that had just seen its best player go down, and thanks to him FSU’s biggest weapons (Nick O’Leary and Rashad Greene) were held to a combined seven catches for 63 yards. Certainly the most inspired performances I’ve seen in my tenure at Oregon — hats off to you, Mr. Dargan. 3. The Ducks can afford slow starts (Royce Freeman three-yard run). In both the Arizona game and the FSU game, Mariota started slow. In this game especially, Mariota missed multiple open throws including what would have been a touchdown to Dwayne Stanford. His struggles were capitalized when he and WR Darren Carrington had a miscommunication and Mariota threw his third pick of the year. After the first half jitters melted away though, Mariota was his normal spectacular self. Royce Freeman and Thomas Tyner kept the Ducks in the game while Mariota got settled, and once the turnovers started coming FSU never stood a chance. The Ducks’ offense is dynamic enough, and they have enough weapons, that even with a slow first half they can still beat an exceptionally good team by nearly 40 points. 4. Darren Carrington is in another world right now (Darren Carrington 56-yard catch). Darren Carrington celebrates after one of his two touchdowns on New Years Day. Carrington, a freshman, is simply phenomenal. The 6’3″ freshman has 14 catches for 291 yards and three TDs in the past two games, but none bigger than the 56-yarder he broke off to give Oregon a 12-point lead in the third quarter. He was Mariota’s safety blanket, making huge plays time after time when Oregon needed him the most. His unique size and speed make him just another one of the weapons, courtesy of Oregon’s bountiful receiving core. Considering the injury to Allen and the already injured Pharaoh Brown and Bralon Addison, the Ducks needed someone to step up. Here he is. 5. Mariota wins the battle of the Heisman’s (Darren Carrington 30-yard catch). Even with his early struggles, Mariota clearly dominated the Heisman battle. Winston’s two turnovers were killers for FSU, and although they were both results of other FSU blunders, they caused Winston to fail at what had been his signature throughout his two-year tenure at FSU: Win. Mariota used his combination of speed, elusiveness and accuracy to lead Oregon’s 41-point second half attack, whereas Winston missed throws, drew a delay of game penalty and of course made two stupid turnovers. Mariota accounted for 400 total yards of offense, and although Winston’s 348 passing yards was an impressive stat, that’s about all he had going. If NFL scouts didn’t have evidence to take Mariota over Winston before, they certainly should now. 6. Hitting the key numbers (Tony Washington 58-yard fumble return). There are two key numbers to Helfrich’s stint at Oregon: 36-0 and 20-0. The Ducks are 36-0 when they score more than 30 points, and 20-0 when they run for more than 200 yards. Well the 59 points was almost double what he needed, and the 301 rushing yards was more than enough to meet Helfrich’s standard. Check and check. Ohio State be warned, those are the numbers Oregon needs. 7. Mariota no longer can impress me (Mariota 23-yard run). Well, that’s a little dramatic. But honestly, what he does is almost just expected at this point. A 72 percent completion rate, 338 yards passing with another 62 rushing and three total touchdowns. Numbers that most QBs would dream of, Mariota can put numbers like that up in his sleep. His dominance is no longer impressive, it’s simply a reality. He will play an excellent game each and every week, and that’s just the truth opposing DC’s will have to face. There is no longer an option of stopping Mariota, but instead can you even remotely slow him down? Also, I apologize for the quality of the video, but this was just too great to leave out. 8. Nothing new, simply dominant. In conclusion, the biggest takeaway from this game is that the Ducks were just simply better than FSU in every facet. Charles Fisher, the creator of FishDuck.com, wrote an excellent article emphasizing just this. The up-tempo offense paired with the impressively conditioned players had FSU’s defense with their hands on their hips by the start of the second quarter. Mariota put the ball right where it needed to be time after time. The defense created turnovers. That’s it. There were no trick plays, new schemes or formations. It was the same Oregon team that has come out to play all season long. With a week and a half to rest and prepare, the Ducks are certainly the team to beat.